For Creamy: Place all of the peanuts in the Vitamix blender or a food processor. For Vitamix users: set the blender to variable setting 1, turn it on and quickly turn the setting up to 10, using the tamper to aid in the pureeing process. For food processor users: blend the peanuts until a peanut paste ball is formed. Then add oil, a few drops at a time, until peanut butter reaches desired consistency. For both: taste, add salt as desired and blend for 10 more seconds. Store in an old, cleaned peanut butter jar. For Crunchy: Chop or blend 1/2 cup of the peanuts until chunks are of desired size, then place into an empty peanut butter jar. 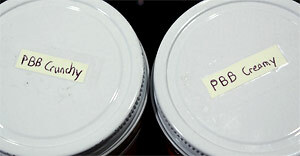 Now, use the remaining 2 cups of peanuts to make creamy peanut butter as outlined above. Pour into the jar and mix it all together with a knife. how wonderful! I like creamy :D.
Awesome. I just got a food processor for Christmas and have been playing with it for peanut butter, pecan butter, and hazelnut butter. I definitely need to try doing it for different lengths of time to change up the consistancy. I need to play with other nut butters too, what’s your fav so far? Good to see you getting back to your roots. I used a special “peanut butter maker” for my homemade. It took forever to grind the peanuts but it did make a diff. to the taste. Have you tried it in a food processor? I think it is so good to make your own pb that way you control how much oil you like/dislike. Great idea – great post! peanut butter maker? Is that one of those newer products on the market? I heard they broke down really easy. Yes, I’ve tried the food processor, it works well but you need a few drops of oil to get it to blend right. It would be awesome for you the own a pb company! Can’t wait. I SO want a VitaMix! The best peanuts I had were from Virginia as well. I can’t remember the brand but they were called “extra crunchy” peanuts and as their name suggests, they were extraordinarily crunchy and flavorful. I need to find some to make peanut butter out of. Although I did hear once that most companies don’t Virginia peanuts for making peanut butter – I believe it’s because they have a slightly lower fat content (hence the crunchiness) and don’t blend as well. But I recently had a brand that used those extra crunchy peanuts (Appomattox River PB) and it was fantastic! The moral of the story is: I need to find those peanuts! Mmm that looks great! After I made the cashew butter the other day, I experimented with sesame butter, too. It was alright, but the cashew butter was REALLY good. Walnut butter is up next! I can’t stand cashews but perhaps I’d like cashew butter better. Sesame butter is just tahini right? I bet that would be better if you toasted the sesame seeds first in a pan then blended them. I wanna try an almond walnut combo butter! I think that is BRILLIANT. You should start a peanut butter company!!! Well thank you, I hope someday that it does in fact happen! Yes, yes and yes. Everything homemade is better. I recently made homemade hot chocolate….I didn’t know hot chocolate could be so good or drank so fast! Happy New Year! It’s true, I better take advantage of the New Year luck and charm before it’s too late! This is unrelated but I had to mention it. I had half a jar of peanut butter and half a jar a almond butter left in my fridge, so I decided to mix them. Not a good idea. It ruins the delicious milder taste of the almond butter and takes away from the peanut butter’s flavor, leaving a just not-as-good-as-by-itself flavor. Haha, thanks for sharing. I was always wondering about that actually, now I know never to attempt it! But hey, someone has to try it right? If it weren’t for people like you experimenting, how would our species ever discovered things like ice cream or gelatin? Interesting, I’d love to hear the results and/or the recipe! Oh nice….you’ll have to let me know how it turns out! A Vita-Mix is on my wish list, too! Can’t wait to make my own nut butter. Haha Michele, at first I thought you were coming on to me, then I realized you were talking about the edible “date”. Yes, that sounds quite delicious =). Dude, that is a major compliment since you clearly have me beat hands down on all things peanut butter. However, I do challenge you to figure out a better way to get pb and sauerkraut to work! I’ll be subscribing to your blog waiting for the solution to pop up in a future entry. PS – Using honey roasted peanuts for homemade peanut butter is probably the most amazing thing ever. Haha, well sauerkraut is just boiled down cabbage right? Perhaps skip the rinsing off of the vinegar and use boiled shredded cabbage? I concur with the honey roasted part! 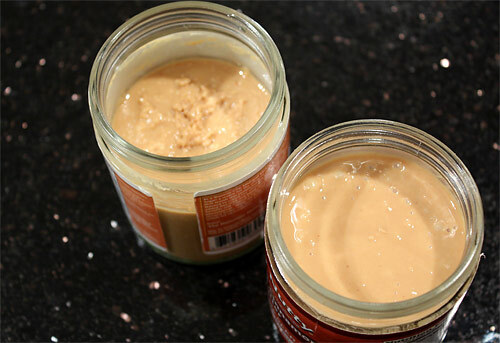 You can also simply pour some honey into your peanut butter jar: see my honey roasted peanut butter recipe! Hi Nick! I just discovered this gem of a blog. Lately I have been following the “Chocolate-Covered Katie” blog, and my sister joked that I am going to start my own blog, called “Peanut Butter-Covered Jaris.” But it looks like you beat me to it! Well, greetings to a fellow PB enthusiast. Anyways, we always make our own peanut butter. We even gave it out last year to the neighbors for Christmas presents! We just use a food processor, but if you persevere through the “revolving mass of peanut butter” stage, we have found that it smooths out on its own without any added oil. And then the warm, gooey, fresh PB is perfect for dipping! (celery, marshmallows, cooked carrots?! – some of our faves). Another thing to try is dipping banana slices in the fresh peanut butter and freezing them, for an irresistible and nutritious dessert slash snack! Hey Jaris! Sorry I never replied to this, I somehow overlooked it! Well I didn’t name my blog Peanut Butter-Covered Boy, so feel free to go for it =]. I love homemade peanut butter too, but I tend to do it very infrequently – I think it’s because buying peanuts is more expensive per pound than peanut butter and also because I eat SO much peanut butter that I would have to make so many batches! However, when I do make it, I use my Vitamix and it works wonders – it quick gets past that annoying “peanut meal ball” stage and comes out warm and runny. So you like dipping cooked carrots into peanut butter? Never tried that one, but my favorite snack nowadays is fresh baby carrots dipped in peanut butter. I like it better than apples or bananas with peanut butter. Celery is good too, but i find it’s only good when dipped in a salty, no-sugar-added peanut butter to complement the saltiness of the celery. Frozen banana slices with peanut butter – I’m going to make some tonight. Maybe after freezing them, dip them in some melte chocolate and re-freeze? I just got a Vitamix, but I find peanuts, almonds, etc. cost more per pound than a natural nothing added butter from a the national organic supermarket chain we all know. Does anyone have inexpensive quality sources for legumes and nuts? Or do you just pay more to make it yourself anyway? I hear ya Joe, I’ve always had that problem with making homemade nut butters. I do it more as a once-in-a-while treat than as a routine thing. The best way to do it is to wait/watch for sales on nuts at the store or try to buy in bulk online. However, the Vitamix makes some excellent nut butter, so I highly recommend it! Hey, I just came across your blog looking for recipes like this. The blog doesn’t show the year, so I hope this isn’t too much of a necrocomment. In addition to the Vitamix, I can vouch for the Ninja. It makes quick work of making peanut butter too. In fact, it is probably the sole reason I bought mine (the second to make easy hummus). Now I’m looking to experiment, going to try your spicy PB next. As far as getting nuts, I just wait as you do for sales. Once in a while they go on sale 2/$5 for a pound jar, and I grab a bunch. Good to hear. I hear the Ninja is great, but I haven’t had experience first hand. At 1/5 the cost, the Ninja sounds like the perfect alternative. If I hadn’t gotten the Vitamix as a gift, I’d be kicking myself for not getting the Ninja instead. What’s funny is that this post is actually a few years old, and I actually started a peanut butter company almost 2 years ago! And yes, try the Spicy PB! It’s phenomenal!